When you get right down to it, not many comic book characters last for 75 years, especially female ones. Yet Wonder Woman has done so. Here at First Appearance, we are on pins and needles to see the adaptation we have been desperately crying out toward the movie gods! With that in mind, here are our top ten reasons to see Wonder Woman on June 2nd! Here at First Appearance, we do our best to stay away from early reviews and spoilers. However, with the many websites we frequent and with the constant hand wringing we have been doing these last few weeks, it is hard not to hear some initial impressions. Thankfully, we are hearing that this movie is getting some great response. While we will not put up our review until later this week, we are excited to hear that DC is pulling themselves up out of the mud and pushing forward with a movie that is definitely needed in the win column. As most comic book fans know, as we do here at First Appearance, DC has been really missing some great opportunities with their last few movies. Wonder Woman’s arrival is desperately needed as the only thing that DC is doing well at is television (seriously, check out the season finale of Arrow, one of the best episodes in a while). Thankfully, Wonder Woman is learning from DC’s previous films and doing the opposite it seems, which is reason enough for all fanboys and fangirls to go see it. 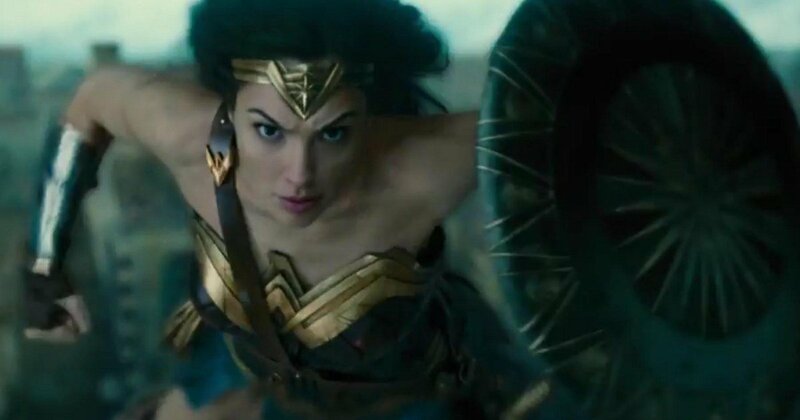 The original Wonder Woman was at the L.A. premiere of the film back on May 25 and officially gave her blessing not only at passing the torch to Gal Gadot, but to also praise (highly) of the upcoming film. Several posts on her Twitter account shower the studio, DC, and Gal herself for putting together a tremendous film. Carter played Diana for four years (1974-1977) on the television show by the same name and Carter herself had always advocated for a Wonder Woman movie whether she was the key role or not. Getting the seal of approval from this strong, feminist icon makes us excited because for a lot of us, until Gadot took up the bracelets and tiara, Carter owned that role and embraced it whole-heartedly even after the show was long gone. If Lynda Carter is saying “yes” to the movie, we can take that to the bank. It was recently announced earlier this week that DC has no deleted scenes for Wonder Woman (yes, you read that correctly) which for some can either mean a good thing or a bad. A lack of deleted scenes here seems to be leaning on the good side due to the fact that it places a lot of trust in the director Patti Jenkins, cast, crew and story-telling. With that in mind, it should get people excited because of the dedication and love that ALL superhero movies need in this day and age, not just Wonder Woman. Again, it seems that DC and Warner Bros. have taken a step back from what they have done in the past with their movies and actually let Jenkins do her job and it is paying off. Hopefully, both DC and Warner Bros. will continue to put (and keep) faith in the people they have hired and trust them to accomplish what they set out to do because no one wants a repeat of Suicide Squad. It is true that trailers may take the best bits to entice its audience, yet comedy seems to be genuine within Wonder Woman. While the trailers provide some chuckles, as do some clips, the comedy seems real and right due to the interviews with the cast. Recently, Chris Pine and Gal Gadot did a tour of shows and interviews promoting the movie and it was increasingly apparent that comedy was necessary to push this tale forward. Pine’s character, a man’s man of the war and stealer of women’s hearts meets up with a woman who only sees the world in black and white to major values like justice, love, and war. In the world of literature these characters are known as “foils” and typically foils rely on comedic enterprise. Nailing down those characteristics helps the authenticity of not only comedy, but other necessary emotions that make the story, setting, its characters, and overall atmosphere believable and accepting. Whereas in other previous DC movies, the comedy was forced and it came off as more cringe-worthy, Wonder Woman is showing viewers what happens when a naïve woman meets an action-adventurer and his many “exploits”. While there is some straying from the original story of Diana’s first appearance in All-Star Comics #8, the heart and core of the initial issue is front and center and even after 75 years still relevant. A world experiencing chaos, civilians not sure where to look for hope, inequality on all fronts for creeds, religions, gender, and ideas, these issues resurfacing (or never really leaving depending on how one looks at it) are important because the idea behind Wonder Woman’s philosophy is a way to overcome hardships and find peace. Unlike other superheroes and their movies, Wonder Woman remains staunch in her beliefs, morals, values and ethics and does not seem to apologize for female empowerment which is not only necessary as a message, but necessary for the future of strong female protagonists. This drive is the cornerstone for why Diana has stayed around for as long as she has. It seems from the interviews and small clips that Pine really has old school Steve Trevor down and understands exactly where he is coming from in his grand adventure with Diana. We here at First Appearance enjoy his work and feel really drawn to him in this role. While the overall feeling of the movie is to provide entertainment, and showcase the strength of women, it also does not try to emasculate or showcase that all men are hopeless. Having Pine playing the leading male role was a smart choice as he is a deep advocate for women’s rights and also admits that men…well, have and will continue to make mistakes. If what we have seen so far from trailers and clips is carried throughout the entire movie, this could be one of Pine’s best performances. To those who have been following the DC movies, we have already seen Wonder Woman show up in Batman v Superman and we know that Diana’s solo movie takes place a hundred years prior, yet what will be interesting will center on the DC’s and Warner Bros. take on how to bridge the gap. As well, will it be addressed in this movie? Will we see anything in Justice League? Will we have to wait a few years for Wonder Woman 2? Regardless, timeline issues are just one factor to elements of mystery as rumor has it Ares is supposed to be in the film but seeing as how it focuses mostly on the world war aspect it sounds as if he will be a background character. Will we actually see him or will it be a shadowy figure, a few words, and the appearance of red eyes outlining his helmet? Whatever the case may be, audiences love uncertainty in storytelling which is enough to pull us to the movie theater to find out. A beautiful Israeli-born actress, an astounding femme fetal and hard working mother who has poured her heart and soul into becoming a symbol for women’s rights, feminism, equality, justice and prosperity, what more is there to say? Well, in actuality, lots. While this movie certainly establishes her as a fantastic replacement to what Lynda Carter brought to audiences’ years ago, many viewers felt she did a great job (really, one of the few bright spots) in Batman v Superman. Her look was spot on and her brief scenes showcased the potential she had when it came to taking on Diana. As well, her ability to train (seriously, just take a look at her training videos to become Diana) and push herself are not only a reminder of what it takes to be a good actor, but to impress critics and everyone else who have loved this iconic character. She is genuine, honest, and really seems to embody the Amazonian. Any actor who takes on their superhero role at 110% is reason enough to get excited. No matter how you look at it, Wonder Woman embodies female strength, courage and hope. Doing this for 75 years is no small feat and to see a full-fledged adaptation of this immensely powerful character show up on the big screen should be reason enough to pay the price of a ticket. To wrap up 75 years of feminism in one paragraph cannot be done, but what can be done is letting audiences know that everyone needs this movie. Based on how well this movie does over the weekend will lead the way for more female superhero movies that deserve their story to be told. This is not to say that previous works have not helped, but Wonder Woman resonates to a lot more viewers because of her longevity and her sense of justice. She has adapted to the times, suffered loss, saved lives and remained inspirational to both genders. Having Wonder Woman appear in her first solo movie lays the foundation for greater things to come not only from DC but other publishers as well. Again, one paragraph is not going to be enough to do feminism true justice, but the character of Diana is one of a breath of fresh air. We are finally getting a story where we do not need to analyze every aspect of the character’s childhood to remind ourselves why they became a hero, nor are we getting a “revenge for my parents’ murder” story. A concern for a lot of superhero movies these days stems from those two tropes that are becoming worn out and audiences are realizing it now. While this is an origin story, it is from the female perspective of a strong and independent culture that seems to showcase its importance but does not beat us down with its message. Wonder Woman drops herself into a world she has never experienced, nor truly known about and because of it audiences will be receiving a fresh take on super heroism. Whatever your reason is for seeing Wonder Woman be sure to let us know in the comments section what is pulling you into the theaters to see this amazing Amazonian!